There are certain cars that hold a place of folklore in your mind, for me that was a Lexus. Hailing from Ghana and having spent most of my youth in Saudi Arabia, my father’s car of choice was— and also my Grandfather’s— was a Toyota. As such the fondness for Japanese cars was tangible in my household, the pinnacle of which was of course, Lexus. It wasn’t until I moved to the UK in the early ‘90s that my tastes began to diversify somewhat, undoubtedly influenced by the new environment I found myself in, and I found a new direction for my automotive affections. But then as time goes on, tastes change, and with this change comes innovation and more importantly evolution, as motoring brand car silhouettes evolve according to stewardship and trend. Lexus has always been a brand that is tech heavy, and in recent times the styling has become more eye-catching with the sleek, sharp lines combined with futuristic composition evident across the range, from the CT200h hatchback to the popular RX450h crossover SUV. The leaders in hybrid technology, this has now been implemented and combined with the highest level of performance in a car the is as technologically advanced as it looks, the Lexus LC500h. 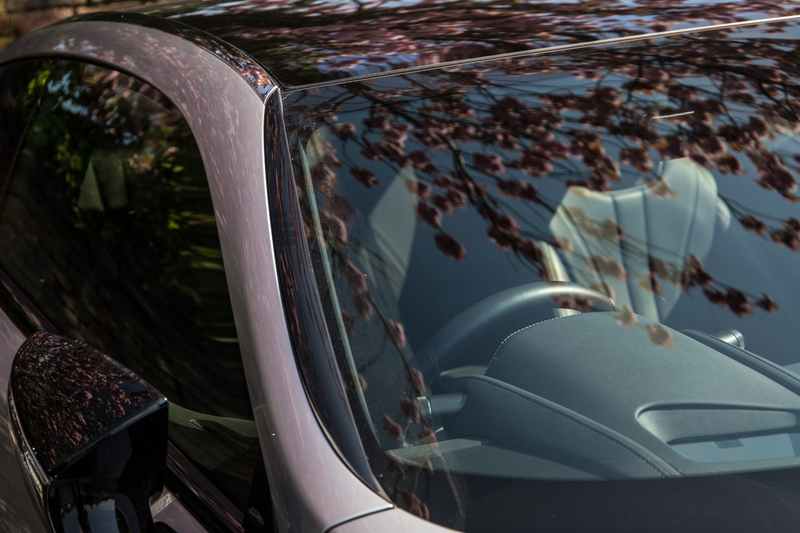 Like other cars in the hybrid range, the LC500h is designed to run as often as possible on electric power, saving fuel and reducing exhaust emissions. Unlike some “mild” hybrids, this “full hybrid also allows the car to be switched to “EV mode” which switches the car to electrical power, and enables it to be driven short distances with zero emissions and fuel consumption. If they were to make a new series of Knight Rider, this is the car he would drive. But then, while this feature is special, it’s something that Lexus have become renown for. What surprised me with the LC500 range was the extent of the driveability coupled with the completeness of the proposition. TI took the V8 petrol LC500 version to road test and the first think that struck me—before I started the engine— was just how elegant the composition of the interior was. 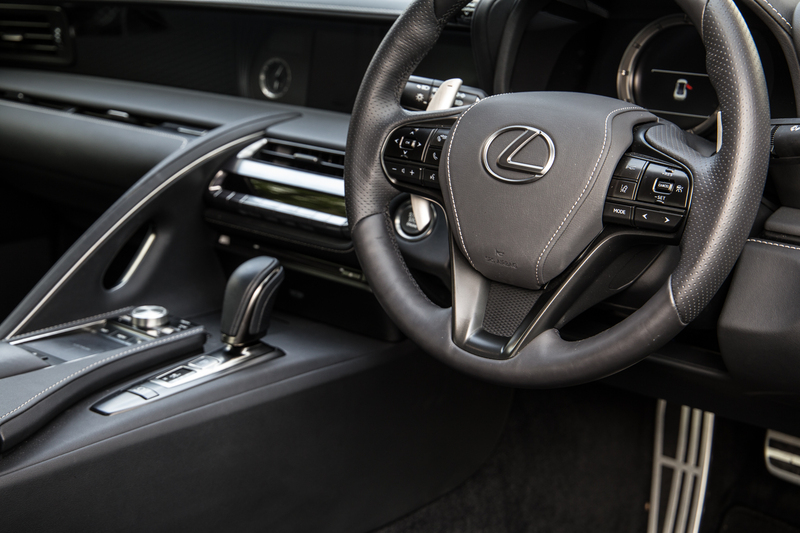 It’s not simply the styling, as the visual integrity of Lexus interiors has never been in doubt, but it’s the rich textures and symphonic lines of the LC500 give it an instant tangibility, a tactile luxury. To drive it’s nimble, lively and most surprisingly— loud. The naturally aspirated 5.0 litre V8 engine is satisfyingly unrelenting in its desire to provide audio encouragement as you accelerate, with a rawness that almost feels contradictory to the futuristic interior. Such is the futuristic design you could be forgiven for expecting the buzz of an electric engine rather than the roar that greets you on engine startup. While the LC500h uses a 3.5litre V6, with a powerful electric motor backed by a 44.6 kW lithium ion battery pack, it still boasts a 0-60 of 4.5seconds— just 0.1 second slower than the V8. It also gives you all the eco-benefits that the hybrid technology brings, making it not only an eye pleaser, but a flexible, futureproof luxury coupe, as perfect for those long distance drives as it is for the daily commute.